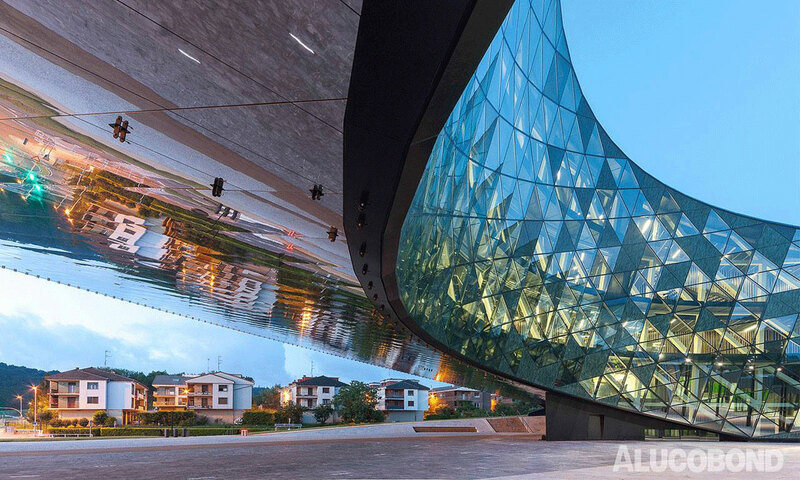 A prismatic, cylindrical building towers over 50 feet high on a 15 degree incline, exposing a reflective pedestal clad with Alucobond naturAL Reflect panels. 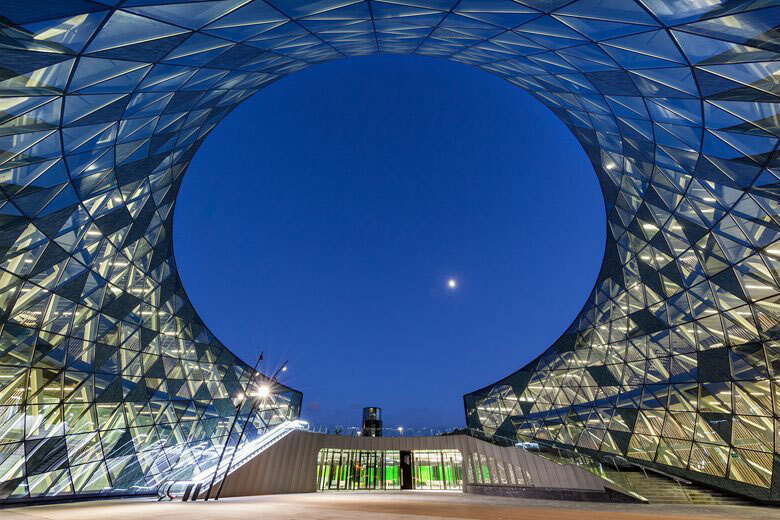 For such a dynamic building, the inspiration is simple, a circle; a shape Orona Ideo uses in the company’s brand image and logo. 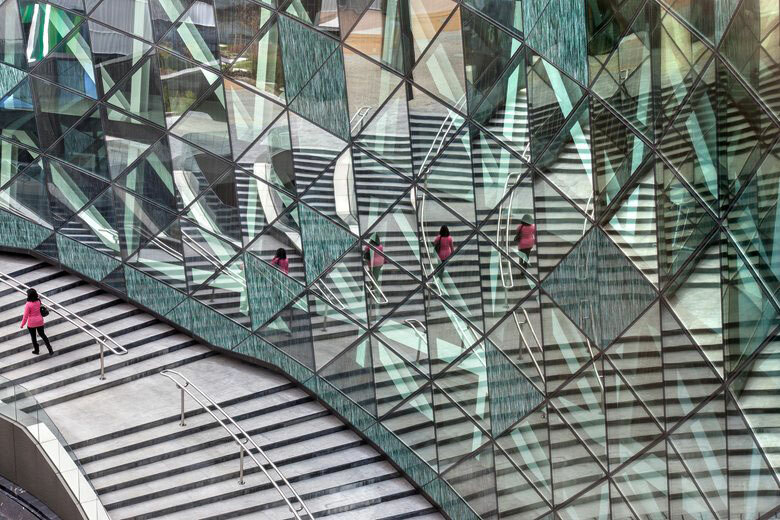 The sophisticated structure is the flagship building of Orona Ideo with over 4,500 employees, researchers and students frequent the headquarters for work and study. 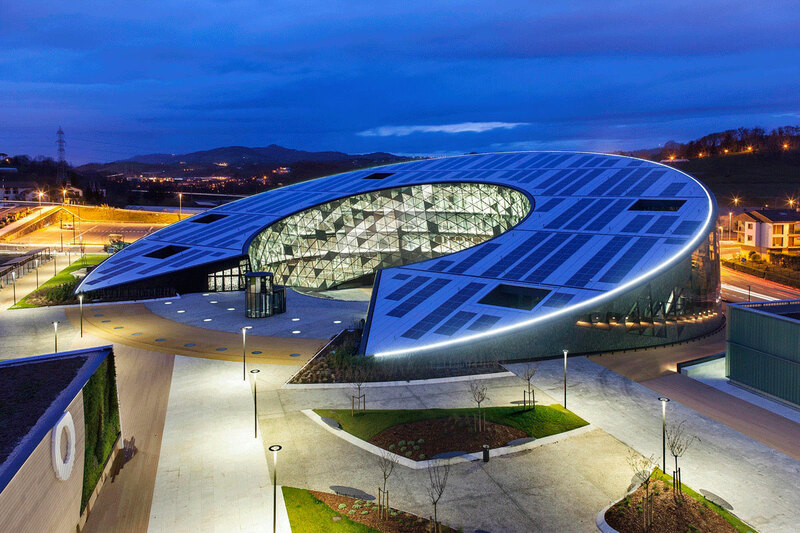 Orona Zero is the new extension of Technology Park of San Sebastian, an area located in the northern coast of Spain in Basque Country. Technology Park is specifically designed for technologically advanced companies and brings together innovative businesses, the local University, and R&D centers that promote synergy between organizations. The infrastructure is purposed to support links between technology workers in order to maximize full technological capacity. The building provides an innovation ecosystem and an environment where the co-existence of diverse expertise paves the way for new discoveries to be rapidly deployed into viable solutions. In addition to the benefits of working synergistically with other technological teams, the building has achieved LEED Gold and BREEAM Excellent certifications. The World Green Building Council has selected Orona Zero as a candidate for Health, Wellbeing and Productivity in Offices for its power and heat generating solar roofing. The rooftop is made up of over 1,000 polycrystalline photovoltaic modules that will capture solar energy for the building. For a building that has high-energy demands, the offset of the solar energy keeps the electricity output at that of 100 average apartments according to the architects, Barrutieta + Goikoetxea + delaFuente + Perez. The interior of the building breaks out into traditional offices, closed meeting rooms and common networking spaces that are contrasted with alternative lounge areas for personal work and informal meetings. An innovative interior placed inside such an elegant exterior, evokes a character to the working environment and plays a special part in evolving the brand culture. 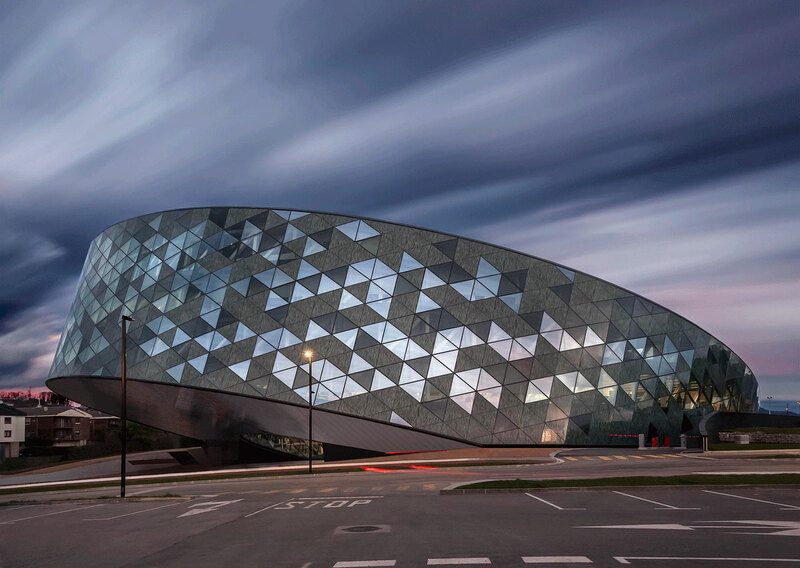 The exterior, curved façade is made up of 2,000 triangular components that create a lively display of opaque, translucent and transparent surfaces catching the sun at differing angles throughout the day. The outer incline of the building creates a sloping line that nearly meets the ground on the rear, and forms an overhang at the entrance. Cutting-edge corporate design isn’t new for tech companies, but the Orona Zero building takes a sustainable lead with its high performance amenities. Technologies that include communication, advanced electronics, engineering, environment, and biotechnology in the Technology Park will benefit heavily from the addition of Orona Zero.